I remember the last birthday only too well. And the months that followed unleashed experience after experience that immediately made me a 'grown up'. It is amazing how you can remain a child at heart for a long while until one incident comes along that kinda changes it all. It definitely is nicer when I am safely cocooned by my mom. But really the cocoon can take only so many cannon balls :) Someday the butterfly will have to face them on its own and choose to either survive or succumb. This, only time will tell. I don't know when birthdays ceased to be something I looked forward to. Or I wonder if I ever did. It remains yet another day in my calendar. Another day, I hope I ll wake and find out I can still sing. And that I am still alive. As a child I remember my grandmother saying pozhachukadandha I ll have to do this, that and that. To me Pozhachukadandha was a word that meant 'morning'. Until just a few years ago, I realized how that generation kept saying, if I am alive (by God's grace) I shall do this, this and that. If there was one thing I have learnt, even more so the past year, was the fine art of detachment. Maybe some zen master came and taught me in my dreams. :p And the concept of expecting nothing from anyone except from music of course .... But I think this life kinda reinforced that in me more than anything else. Taking off from here, music continues to be the one thing, (which I think any serious musician will tell you) that gives you as much or more in 'return' than what you give to it. People have come and people have gone. Some have left a mark; some a scar. And am grateful for both. Last year I felt grateful for the solid support that came in through unexpected quarters. For the beautiful songs that came my way as a blessing. For the love. For the prayers. For everything and more, I am grateful. May you have another fruitful and wonderful year ahead as always. All the best and god bless. Many many more happy returns of today...and please do not cease to inspire us. THANK YOU. I wish you a very happy birthday and may God Almighty continue to shower his blessings on you! :)Finally your birthday has broken the silence. Happy about it. Good to know you have grown stronger. "Art of detachment" a must lesson for many comes with huge cost and pain. I too learned it very recently. But its a good feeling after the lesson is complete. Hope your mind is free now. Wish you grow stronger, attain more peace and make all happy with your music. And please, blog frequently. I love reading your blogs. May God bless you with all that you wish!! Have been a silent reader of your blog for sometime now..but couldnt resist to comment for your birthday! Btw, my birthday is on Sep 11th! 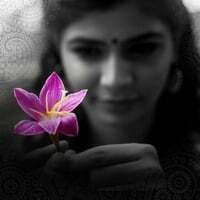 Happy birthday Chinmayi. May you be as strong as ever and may you achieve much more. All the best.